I was born in Dayton, Ohio. My family moved to the SF Bay Area before I entered school. I have had a life-long love of art. I worked in an art gallery and as a department store interior designer. I became enthralled with water media, and knew this was an absorbing passion. I have a Signature Membership in the California Watercolor Association, and I was awarded a scholarship to the Academy of Art in SF in 2007. I spent formative years in Burlingame, graduated from UC Berkeley, lived in Oakland when first married; and then my husband, Andre, and I have raised our family in San Jose. Back in the 60’s, the county was known as the Valley of Hearts Delight. Now it is the hub of technology and is Silicon Valley. I work with watermedia: watercolors and acrylics and mixed media. I often use yupo (Yupo is polypropylene.) 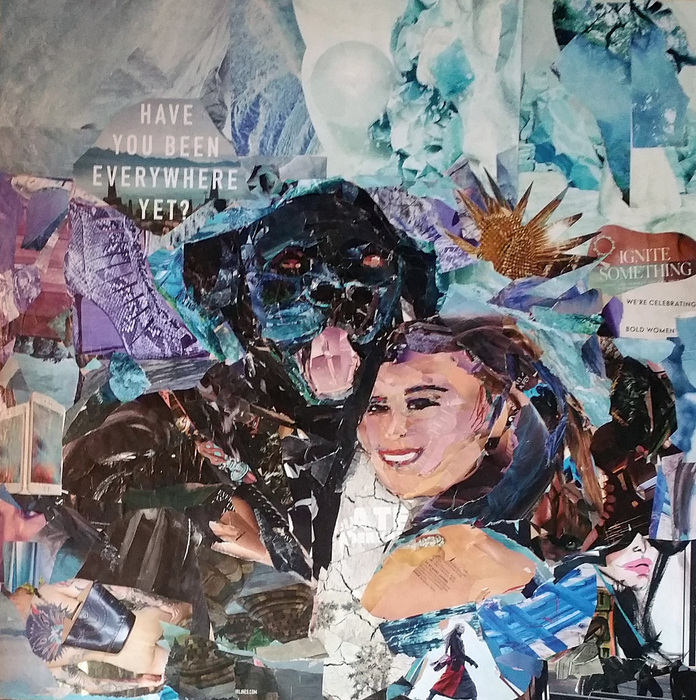 My most current work is with collage of torn magazines. Many have been in national shows. I do the portraits to tell a story about people and their life passions. I do show the diverse community of Silicon Valley in my art. I once considered whether I should hire an art consultant.One woman was frustrated because my website was under construction. There were only 3 images of my work at the time. She told me that I was "JUST a woman of a certain age who'd JUST been a caregiver all my life." She also didn't think I was capable of doing figurative work. I did not sign up to work with her. This is the art work that conveys that story of "Just a Woman". 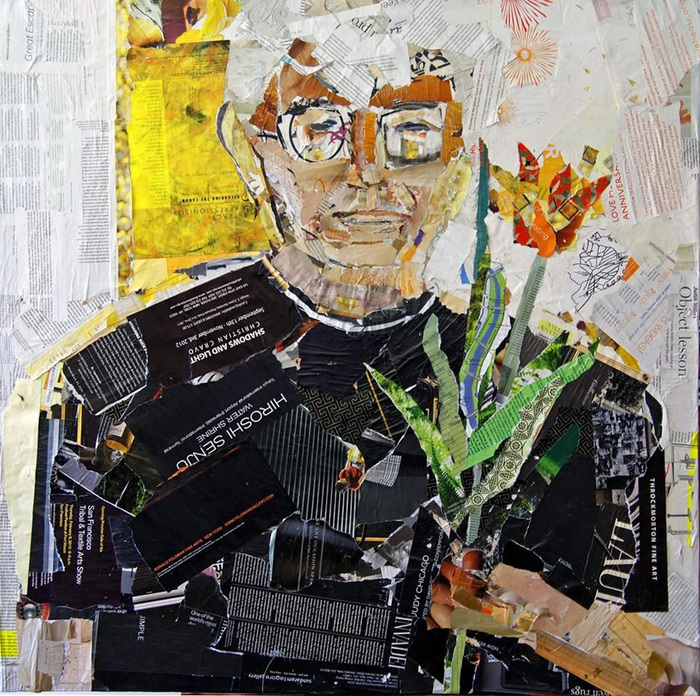 This self portrait collage won the International Manhattan Arts Award in Bold Expressions in October, 2015. 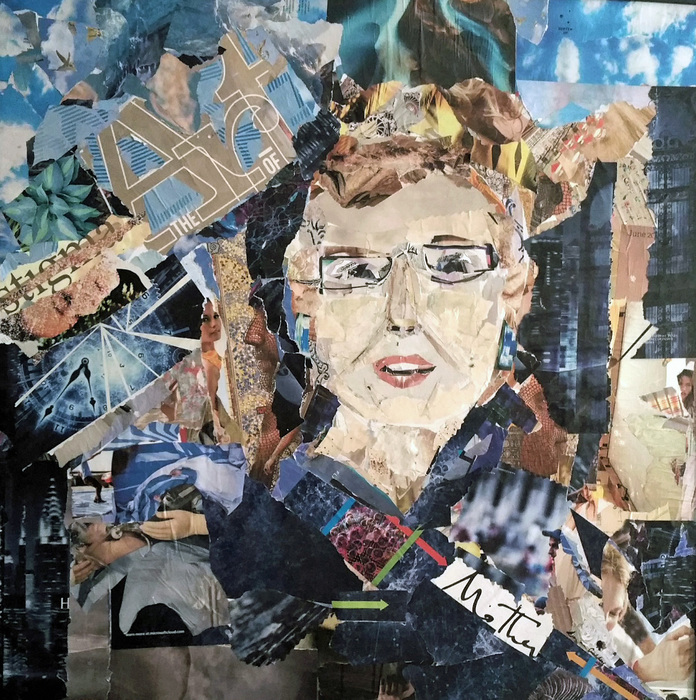 I do story portraits in collage and mixed media with many in national shows and people seeking my work. As a child, this young man, Andre Joseph, loved to draw monsters, and I collected them over the years. Now that young man is a graduate of film school. He also received a scholarship to study film in Prague. He is in the Los Angeles film industry as a newly hired, creative. He is the New Man About Town. I am a member of a local gallery that featured Dia de las Muertos, Day of the Dead in late October last year. The celebration of life is to honor the dead. It is a cultural institution of Mexico. In California we are beginning to appreciate this as an honor for those who have passed on. There were several dancers at the event and one of the most colorful was a young woman from Ballet Folklorico. We have a fun and sassy granddaughter who took her dog for his birthday to celebrate in San Francsico. The dog is named after Sigmund Freud. She was travailing several hundred miles from Chula Vista down near the border of California. Fun clips from magazines tell her story. 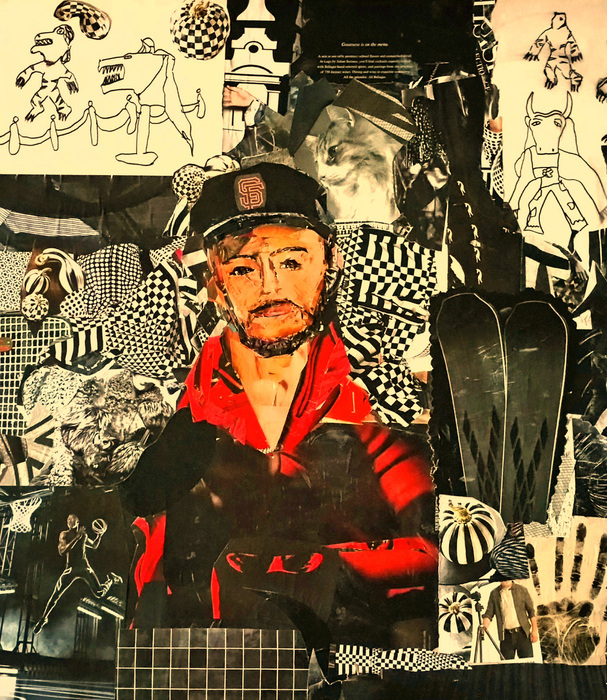 This collage is mounted on a board. 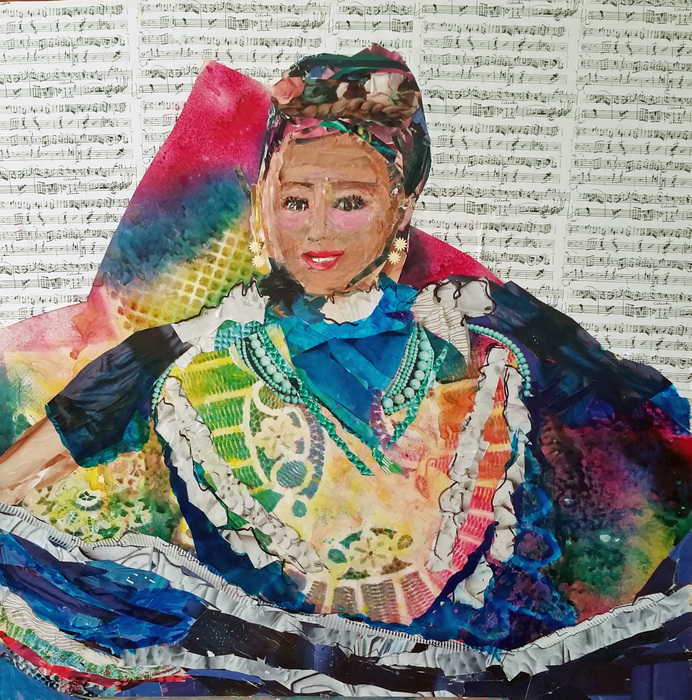 I love to create a portrait using pieces of magazine or paper painted with watercolor or acrylic. The details surrounding each portrait can tell about a person's story and his passions. I worked for years around and near art. I worked in a gallery, I was an interior designer, I took art classes. Finally I made a commitment to be an artist and show my work publicly.When I wanted an art consultant to look at my work and give me support. I was in the midst of making up a new website and there were very few images to show. At one point the consultant said in a disgusted manner, Oh You Are JUST A WOMAN of a CERTAIN AGE who Has Been A CAREGIVER All Her Life." Well, my self portrait called Just a Woman won the International Manhattan Arts Award in 2015. For many years I studied the Japanese floral art of ikebana. I love the Japanese way of negative space around the flowers and the simplified way that makes each flowers special. My teacher asked her teacher, Sensei, to do a demonstration of his Ikenobo style, I was taken with his contemplative way to hold the flower and consider the best way to make the arrangement. The Ikenobo school is one of many schools in ikebana. It is considered the oldest school and thus the most traditional to the culture.